Introduction: Parameters used in facial aesthetic surgeries are currently based on POWELL and HUMPHREYS (1). These authors have formulated suitable relations between the face and the nose, and defined the face angles. Objective: To compare pre and pos-operative nasolabial, nasofrontal, nasomental and nasofacial angles in patients submitted to rhinoseptoplasty. Method: Prospective analysis of 37 patients submitted to rhinoplasty, with an average of 30±11 years of age, being 13 (36%) men and 24 (64%) women. The nasolabial, nasofrontal, nasomental and nasofacial angles were measured and compared, before and after the surgery, in profile pictures. 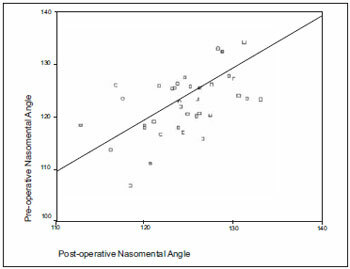 Results: An average increase of 8.6o in the nasolabial angle was observed, of 8.5o in the nasofrontal and reduction of 2.3o in the nasofacial angle, and all the measures presented a statistically significant difference between the pre and pos-operative period. The nasomental angle increased, on average, 1.6o, a difference without statistical importance. Conclusions: The nasolabial and nasofrontal angles increase significantly after rhinoseptoplasty, while the nasofacial angle diminishes. There was no significant alteration in the nasomental angle with the accomplishment of the surgery. The rhinoseptoplasty is intended for providing an adequate nasal function and a satisfactory aesthetic result. It is difficult to define objectively the beauty of the face, but we can characterize it as a combination of symmetry, proportions and harmonious relationship among the structures. Parameters used in facial aesthetic surgeries are currently based on Powell and Humphreys (1). These authors formulated suitable relationships between the face and the nose and defined facial angles. The objective of this study is to compare pre- and post-operative nasolabial, nasofrontal, nasomental and nasofacial angles in patients submitted to rhinoseptoplasty at the Clinical Hospital of the Federal University of Paraná. We evaluated prospectively 37 patients submitted to rhinoseptoplasty at the Clinical Hospital of the Federal University of Paraná, in the period between February and October of 2007. They were on average 30±11 years old, ranging from 16 to 60 years of age and were 13 (36%) men and 24 (64%) women. All were submitted to rhinoseptoplasty under sedation associated with local anesthesia and the surgeries were carried out by third-year resident doctors in otorhinolaryngology, always accompanied by a supervisor. The evaluation was made through digital pictures. 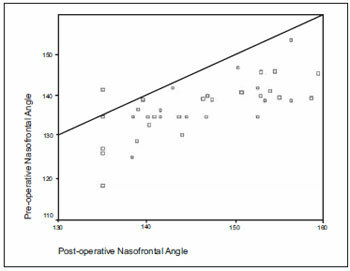 The nasolabial, nasofrotal, nasomental and nasofacial angles (Picture 1) were measured and compared, before and after the surgery, by using the MB-Ruler program in the right profile pictures. Picture 1. Nasolabial (A), nasofrontal (B), nasomental (C) and nasofacial (D) angles. The nasolabial angle is formed by the union of the columella and the upper lip; the nasofrontal angle is created from the nasion, that touches the glabella and the nasal dorsum; the nasomental angle is composed between a straight line that touches the nasion and the nasal tip and another one that touches the nasal tip and the pogonion; the nasofacial angle is defined by the inclination of the nasal dorsum associated with the facial plan and corresponds to the nose projection. The data obtained were computed and analyzed with t test for samples compared by using the program SPSS 10.0 for Windows. The statistical significance was considered to p<0.05. All 37 patients were submitted to primary rhinoseptoplasty under sedation and local anesthesia. No patient had trans- and post-operative complications. We observed an average increase of 8.6o to the nasolabial angle (Picture 2), 8.5º to the nasofrontal angle (Picture 3) and decrease of 2.3º	to the nasofacial angle (Picture 4), and all measures presented a statistically significant difference between pre- and post-operative. The nasomental angle (Picture 5) increased on average, 1.6º, a difference without statistical significance. Values described of measures of such angles are presented in Table 1. Picture 2. 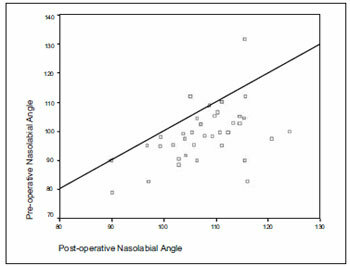 Correlation of the pre and post-operative nasolabial angle. Picture 3. Correlation of the pre and post-operative nasofrontal angle. Picture 4. Correlation of the pre and post-operative nasofacial angle. Picture 5. 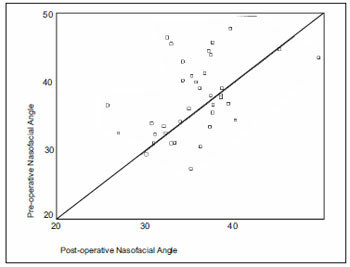 Correlation of the pre and post-operative nasomental angle. In Picture 6 pre- and post-operative pictures are presented of a patient aged 29 years submitted to closed rhinoseptoplasty, basic technique, associated with the intermodal point. This patient presented, in the pre- and post-operative, respectively, nasolabial angle of 79 and 96o; nasofacial angle of 36.9 and 37.6º; nasomental angle of 123.4o and 126.3º and nasofrontal of 139.2 and 139.5º. There are a few articles found in the literature that demonstrate the facial angles measures in patients after the facial aesthetic surgery. According to Powell and Humphreys (1), the ideal nasolabial angle is of 90 to 95o for men and 95 to 110o for women. In this study we found, on average, 107, 6±7,5º in the post-operative period with a statistically significant increase as compared to the pre-operative period. Ingels et al. (2) found a significant difference in the nasolabial angle in patients submitted to open rhinoseptoplasty with placement of columelar graft, resection of the cephalic portion of lateral cartilages and both the procedures associated, but this difference was not observed in the group in which the placement of columelar graft or lower lateral cartilage resection was not carried out. Kuran et al. (3) also observe a significant increase to this angle after the surgery. Wise et al. (4) describe a difference of 1,41±3,33º to the nasolabial angle, without statistical significance between the pré- and post-operative periods. The data this author presents differ from the ones in this study, in which we find a difference of 8,6±9o, with a significant increase after the surgery. Cardenas et al. (5) describe a suture technique to correct nasal tip ptosis and achieves an adequate nasolabial angle. A nasofrontal angle from 115 to 130º and nasomental angle between 120 to 132º are expected. In the patients evaluated in this study we found values of 145,8±7,6º and 124,4±4,6º, respectively. The ideal nasofacial angle is of 36º and the angle in the study's patients is on average of 35,4±4,4º. The nasolabial and nasofrontal angles increase significantly after the performance of rhinoseptoplasty as the nasofacial angle decreases. There was no significant change to the nasomental angle with the surgery. 1. Powell N, Humphreys B. Proportions of the aesthetic face. New York, Thieme-Stratton; 1984. 2. Ingels K, Orhan KS. Measurement of Preoperative and Postoperative Nasal Tip Projection and Rotation. Arch Facial Plast Surg. 2006, 8:411-415. 3. Kuran I, Tümerdem B, Tosun U, Yildiz K. Evaluation of the Effects of Tip-BindingSutures and Cartilaginous Grafts on Tip Projection and Rotation. Plast Reconstr Surg. 2005, 116(1):282. 4. Wise J, Becker SS, Sparano A, Steiger J, Becker DG. Intermediate Crural Overlay in Rhinoplasty; A Deprojection Technique That Shortens the Medial Leg of the Tripod Without Lengthening the Nose. Arch Facial Plast Surg. 2006, 8:240-244. 1. Doctor. Medical Professor of the Department of Otorhinolaryngology of UFPR. 2. Doctor. Head of the Otorhinolaryngology Department of HC-UFPR. 3. Resident Medical Doctor in Otorhinolaryngology. 4. Resident Medical Doctor in Otorhinolaryngology for HC-UFPR. Institution: Clinical Hospital of the Federal University of Paraná. Register in the Ethics Committee of the Organization under no.1779.196/2008-9.Curitiba / PR - Brazil. Article received on September 12, 2008. Approved on October 17, 2008.